Cristiano Bianchin Silenzio (Silence), 2000, crocheted hemp, black paper, found objects, 70.75 in. Photo copyright Barry Friedman Ltd.
"Venice. 3 Visions in Glass" featuring Cristiano Bianchin, Yoichi Ohira and Laura de Santillana (who have shown together a number of times) offers viewers a profusion of innovative forms and gorgeous colors. All three hail from Venice and work on Murano, the fabled center of European fine glass production. Although Bianchin, Ohira and de Santillana are primarily glass artists, this expansive touring exhibition presents their highly esteemed and technically superb work as art rather than decorative objects and celebrates the extraordinary range of their resolutions. Glass, while long cherished by collectors, has only recently been accepted as a medium for fine art as more and more contemporary artists in every genre (many invited to Murano to produce their projects in collaboration with master glassmakers) embrace it, seduced by its enormous expressive potential. or primitive figurines and are greatly influenced by African as well as Native American art. At times, his pieces are partially swaddled in crocheted hemp, a signature combination of adamant glass and pliant organic fibers. Bianchin's vessels recall canopic jars, reliquaries and other ritual objects, as do his smaller implements and abstract constructions-the latter often evoking fertility figurines. Also included are two woven hemp masks hung high on a wall, a double line of crystalline tears falling to the floor from the empty eye openings. 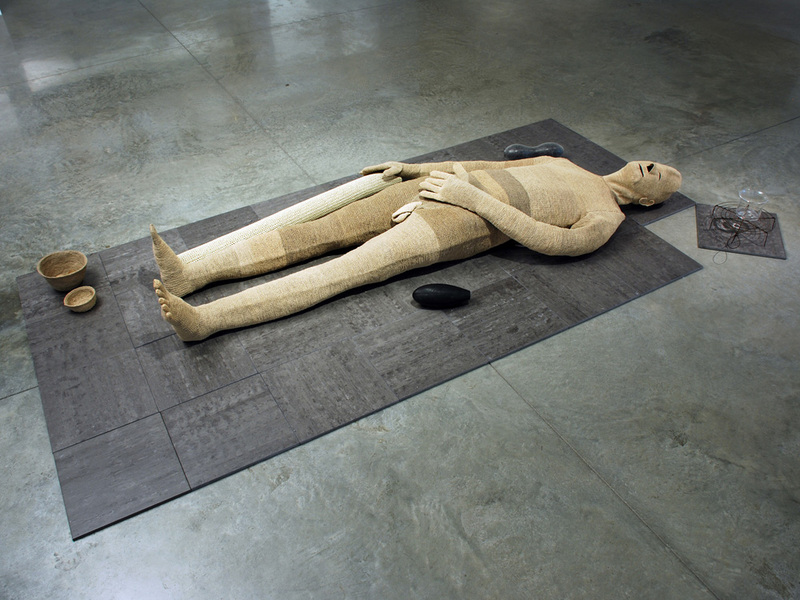 Silenzio, 2000, an effigy of woven hemp (the artist says it's of himself) lying on a pallet surrounded by objects, offers a tableau of multiple readings, including that of the artist as a passive vehicle until animated by creative forces. Yoichi Ohira (b. 1946, Japan) has lived in Venice for over 35 years and also combines cultural legacies, in his case, that of traditional Japanese vessels with Venetian color and techniques. 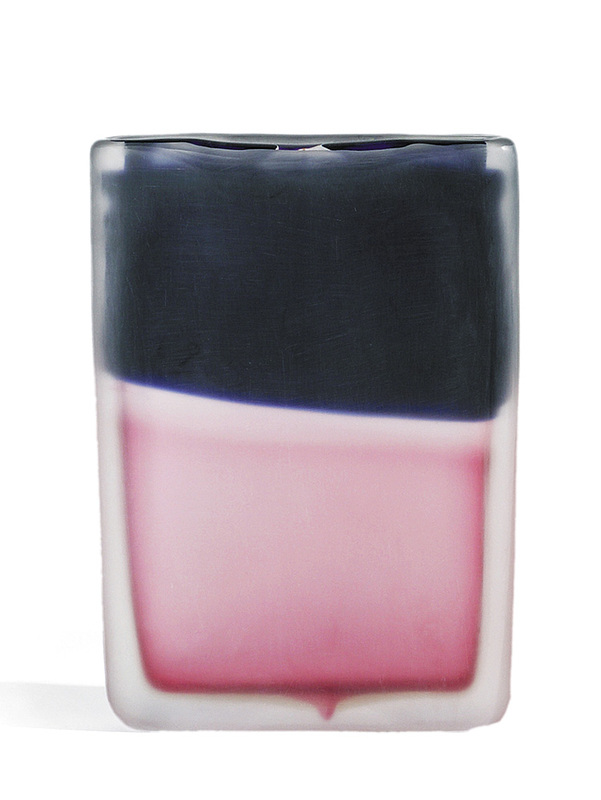 While his glassworks remain essentially objects, rarely higher than 12 inches, they are exceptionally glamorous ones. 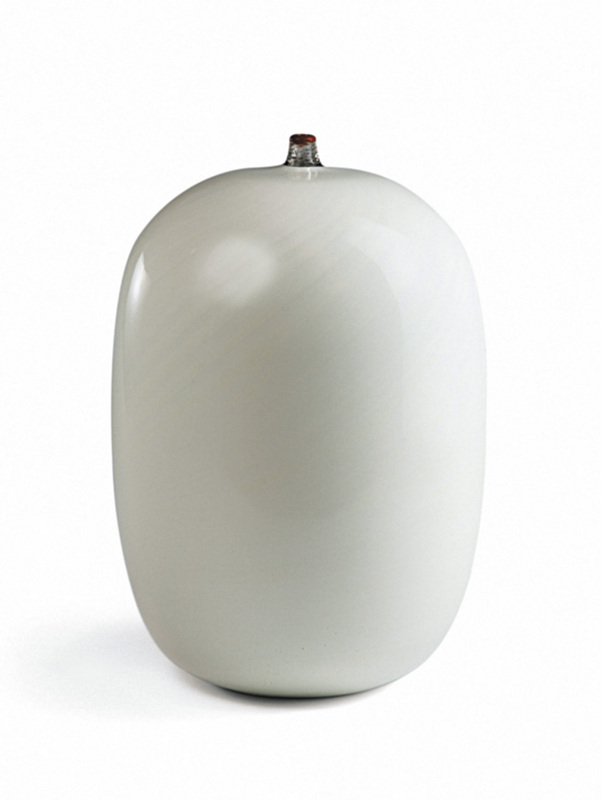 The majority of his more than 100 pieces in the show are based on the vase form, although the sparkling clear-glass Cristallo Sommerso, a new series, was derived from another vessel, the torqued human body. Much praised for his experimentation with color, Ohira has developed a breathtaking palette. His works enclose a kaleidoscope of hues with the fire of jewels as seen in his Calle and Finestre sequences, here inspired by the streets of Venice or Kyoto: the sky glimpsed through a long sliver of space between buildings, a garden, a house, all seen through a window in the vessel. Notturno Veneziano, 2009, is another beauty, its deep, incandescent blue that of Venice as night falls. An earlier work, Quattro Lune con una Foschia, 2006, relies less on light for its effect and resembles a landscape, say, on a Momoyama screen. 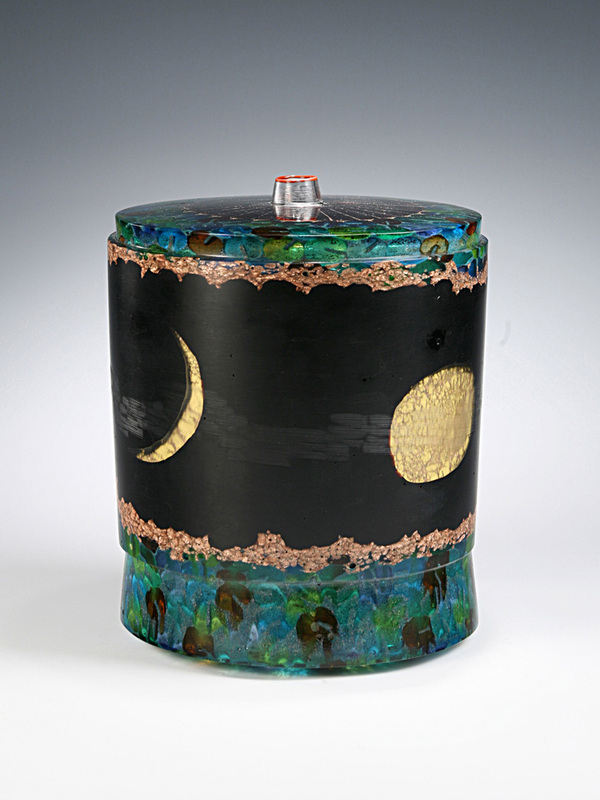 A cylindrical shape with a flat lid, its central black band is ornamented with four phases of the moon in gold and encircled by what appears to be a strip of malachite and coral in a tour de force of material trompe l'œil. The least dependent on traditional forms, as evidenced by this showing, Laura de Santillana (b. 1955, Venice) is represented by glass sculpture, hybrids between sculpture and painting and installations. A recent series, Meteors, was inspired by battered oilcans washed onto a beach. Placed on the floor, they suggest a field of lustrous, eroded boulders from space. More arresting in terms of vivid color are her signature Tokyo-gas and Flags. These beautiful pieces resemble Rothko paintings-as is frequently noted-and other Color Field abstractions, although their duo-tone or triple-tone bands, collapsed between clear glass, are much more brilliant, harnessing actual light and carefully weighted so the slabs are freestanding. Softly glowing, they are one answer to the often-asked question: where did the aura in a work of art go after modernism? De Santillana's perfect Bodhi vases, some with mirrored interiors, could be the platonic embodiment of a sacred vessel and refer to the positions assumed by Buddhist monks in prayer. While less might have been more, "3 Visions" is a stunning showcase of ways to amp up color and light and explore form as it plays with the once canonical distinctions between art, craft and design. Cristiano Bianchin 2 Masks, 2001, crocheted hemp, glass, 105 x 11 x 10. in. 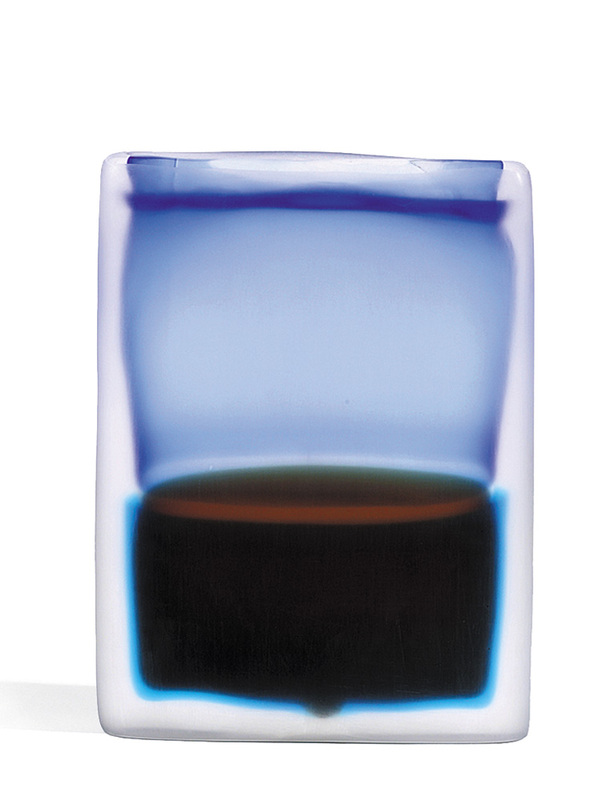 Photo copyright Barry Friedman Ltd.
Laura de Santillana Tokyo-ga XII (Blu Nero/Rubino) 2008, hand-blown and shaped glass, 12.5 x 9 x 1.75 in. Photo copyright Barry Friedman Ltd.
Laura de Santillana Tokyo-ga XIV Bluino/Rosso Scuro, 2008, hnd-blown and shaped glass, 12.5 x 9.25 x 1.75 in. 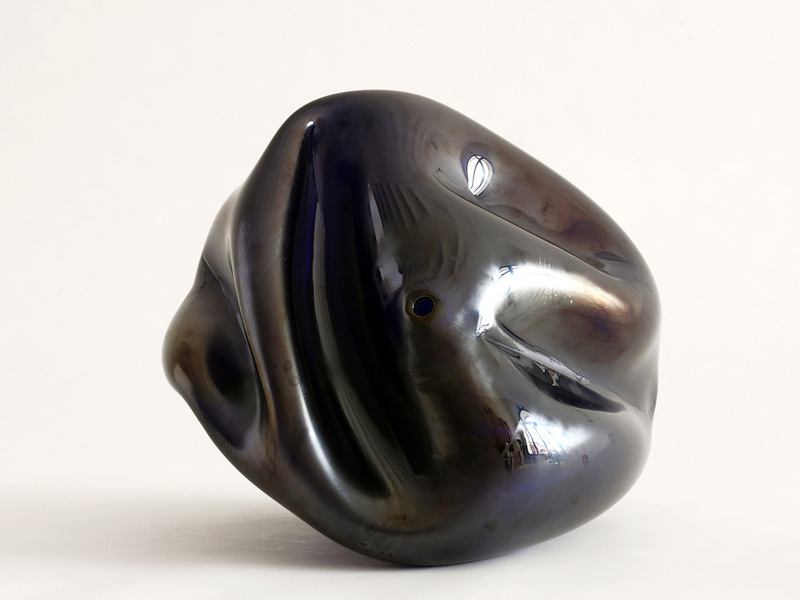 Photo copyright Barry Friedman Ltd.
Laura de Santillana Blu 1, Meteor, hand-blown and shaped glass, 11.5 x 15 in. 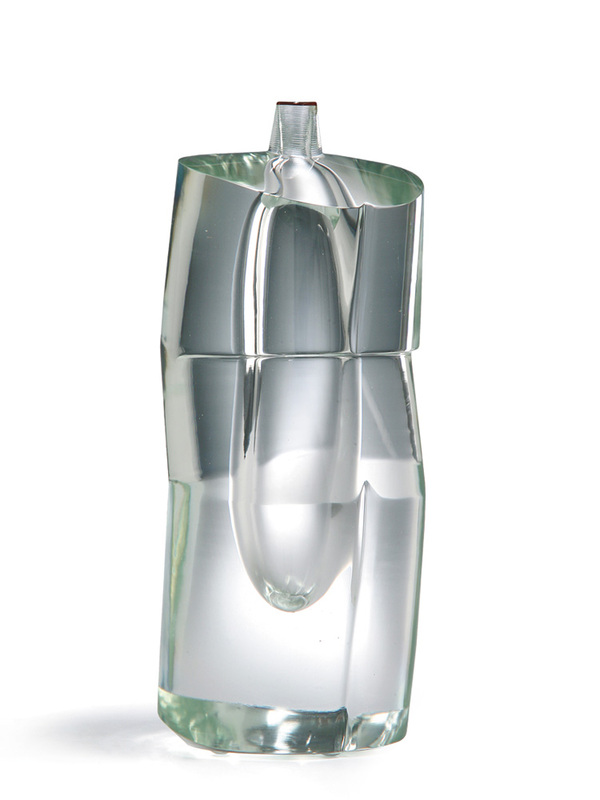 Photo copyright Barry Friedman Ltd.
Yoichi Ohira Avorio Vase, 2004, hand-blown glass canes with murrine, 10.25 x 7 in. Maestro Livio Serena and Maestro Giacomo Barbini. Photo copyright Barry Friedman Ltd.
Yoichi Ohira Quaattro Lune con unaFoschia Vase, 2006, hand-blown glass canes with murrine, avventurina, granular, and powder inserts, inciso and polished surface, 10 x 8.25 in. Mestro Andrea Zilion and Maestro Giacomo Barbini. Photo copyright Barry Friedman Ltd.
Yoichi Ohira Cristallo Sommerso N. 54--Scolpito Vase, 2008, hand-blown glass canes, partial battuto and inciso surface, 11.5 x 4.75 x 4.75. Photo copyright Barry Friedman Ltd.